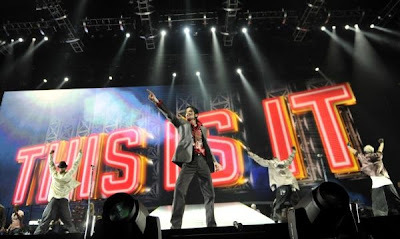 IF you still haven't seen "This is It", the behind-the-scenes documentary of Michael Jackson's rehearsals for what would've been his last concert run to have been staged in London, then go see it quick. The film dispels the rumors that Michael was sick or worn-out before his tragic death on June 25, 2009 at the age of 50. Spliced with a few interviews with his backup singers, his dancers, his band and the other members of the production, the film is really about Michael's dedication to his craft. He was a perfectionist to the core, but wasn't imposing or and was never a diva about it. Every request made of his musicians or dancers was punctuated with a sincere thank you or a "God bless you." It showed how much his fans meant to him that he wanted to give them a really good show. So he had to personally shepherd every aspect of the production. He was in complete control from the very beginning. He was there choosing his back up dancers, getting the tunes of his songs right w/ the band leader, overseeing the filming of his new videos w/c would have been shown in the concerts, etc. Even as he tried to conserve his voice for the actual concerts, or didn't bring out the big dance moves yet, his brilliance as a performer shone through. No matter if they danced the same choreographed steps, for instance, Michael just had his own groove w/c put him above his crew. One tiny pop of his elbow, a shuffling of his feet here, and a kick-turn in place, and he was amazing. But he was always generous as a performer. He wanted his backups to have their moments onstage. Like he would coax the female guitarist performing w/ him to give it her all and say, "This is your time to shine." You could tell that the concerts would have really been fantastic. True to the producers' words, the film is really for the fans. The music alone will want you to get up, sing along and dance. It shows Michael at probably his happiest, just performing onstage, even if these were just rehearsals. That was what made the film so poignant and touched me so that at some point, I couldn't hold back my tears much longer. It was just so great to see him smile again. We love you Michael...always and forever.